This field is more commonly called as combination of somehow natural and social sciences field in which one is related to living and living things whole other is a proper system data and information recording, processing, summarizing, interpreting and presenting. Biostatistics is the area of study where proper data processing and interpretation of scientific and biological data is maintained through statistical applications. This field primarily focuses on variations in the results of scenic or biological applications in different scenarios with different kind of objects at different time intervals. For example examining and recording the heartbeat of a patient just before breakfast in the morning and at late night after dinner. Record the variations and present the facts with concrete justification or interpretation. It is an integral part to advance study in the fields of health sciences, genomics, clinical medicine, proteomics, biology and other such disciplines. Biostatisticians are experts and responsible for keeping the data as well as evaluation on the scientific basis. Becoming an expert in the field of biology and health sciences with proper command of data handling and interpretation requires you to become proficient in the art of managing both biological and record keeping aspects. Brainmeasures Biostatistics is the right choice for you to become an expert and proficient in the field of biology with statistical applications. The course is very well designed by keeping in mind the students of all kind from multiple fields and delivered in a way that there will be no difficulty to understand it from grass root level to advanced level of concepts. Furthermore, this is not the end as your knowledge, skills and expert opinions will also be assessed through an online exam as well as different case studies and scenarios. This will just give an idea to you about how well you are going in the certification course. 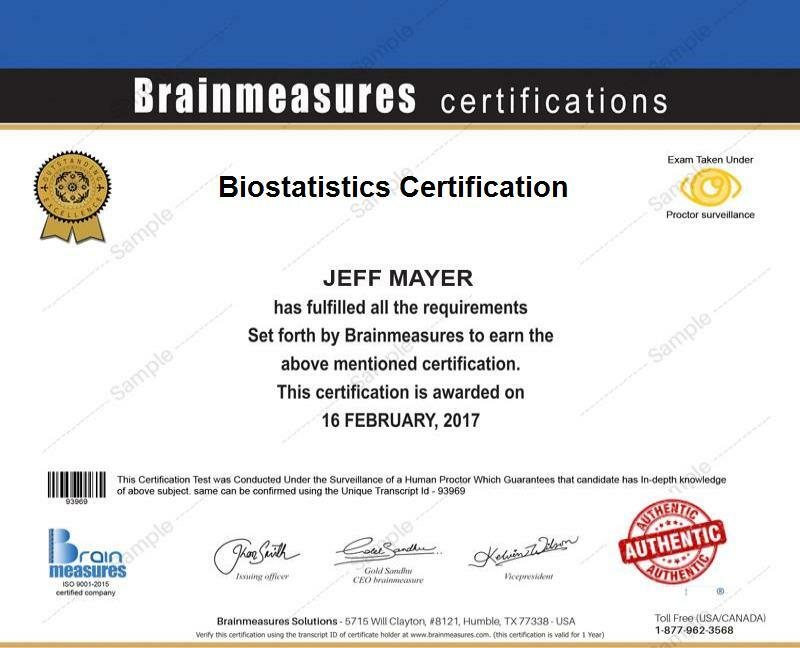 Getting certification of Biostatistics from Brainmeasures is just the beginning of new horizon not to just get the knowledge and expertise but also to increase your salary levels and income generation. The average annual salary for those who belongs to Biostatistics certification can earn $90,000-$140,000 per year and this amount may vary significantly based on the repute of the business, location, benefits and experience of the related person. The Biostatistics certification program can benefit individuals and professionals who are working in different types of organizations. The certification course targets chemists, pharmacists, neurologist, medical statisticians, medical Mathematics experts, statistical analysts, doctors, biologist, medical field researchers and students in the related fields. This is just an exhaustive list based on more relevancy otherwise impact of Biostatistics in different dimensions of medical field cannot be denied.